Aerogel: Gel comprised of a microporous solid in which the dispersed phase is a gas. Note 1: Microporous silica, microporous glass, and zeolites are common examples of aerogels. Note 2: Corrected from ref., where the definition is a repetition of the incorrect definition of a gel followed by an inexplicit reference to the porosity of the structure. Aerogel is a synthetic porous ultralight material derived from a gel, in which the liquid component for the gel has been replaced with a gas. The result is a solid with extremely low density and low thermal conductivity. Nicknames include frozen smoke, solid smoke, solid air, solid cloud, blue smoke owing to its translucent nature and the way light scatters in the material. It feels like fragile expanded polystyrene to the touch. Aerogels can be made from a variety of chemical compounds. Aerogel was first created by Samuel Stephens Kistler in 1931, as a result of a bet with Charles Learned over who could replace the liquid in "jellies" with gas without causing shrinkage. Aerogels are produced by extracting the liquid component of a gel through supercritical drying. This allows the liquid to be slowly dried off without causing the solid matrix in the gel to collapse from capillary action, as would happen with conventional evaporation. The first aerogels were produced from silica gels. Kistler's later work involved aerogels based on alumina, chromia and tin dioxide. Carbon aerogels were first developed in the late 1980s. Aerogel is not a single material with a set chemical formula; instead, the term is used to group all materials with a certain geometric structure. A flower is on a piece of aerogel which is suspended over a flame from a Bunsen burner. Aerogel has excellent insulating properties, and the flower is protected from the flame. Despite the name, aerogels are solid, rigid, and dry materials that do not resemble a gel in their physical properties: the name comes from the fact that they are made from gels. Pressing softly on an aerogel typically does not leave even a minor mark; pressing more firmly will leave a permanent depression. Pressing extremely firmly will cause a catastrophic breakdown in the sparse structure, causing it to shatter like glass (a property known as friability), although more modern variations do not suffer from this. Despite the fact that it is prone to shattering, it is very strong structurally. Its impressive load-bearing abilities are due to the dendritic microstructure, in which spherical particles of average size (2–5 nm) are fused together into clusters. These clusters form a three-dimensional highly porous structure of almost fractal chains, with pores just under 100 nm. The average size and density of the pores can be controlled during the manufacturing process. Aerogel is a material that is 99.8% air. Aerogels have a porous solid network that contains air pockets, with the air pockets taking up the majority of space within the material. The lack of solid material allows aerogel to be almost weightless. Aerogels are good thermal insulators because they almost nullify two of the three methods of heat transfer – conduction (they are mostly composed of insulating gas) and convection (the microstructure prevents net gas movement). They are good conductive insulators because they are composed almost entirely of gases, which are very poor heat conductors. (Silica aerogel is an especially good insulator because silica is also a poor conductor of heat; a metallic or carbon aerogel, on the other hand, would be less effective.) They are good convective inhibitors because air cannot circulate through the lattice. Aerogels are poor radiative insulators because infrared radiation (which transfers heat) passes through them. Owing to its hygroscopic nature, aerogel feels dry and acts as a strong desiccant. People handling aerogel for extended periods should wear gloves to prevent the appearance of dry brittle spots on their skin. The slight color it does have is due to Rayleigh scattering of the shorter wavelengths of visible light by the nano-sized dendritic structure. This causes it to appear smoky blue against dark backgrounds and yellowish against bright backgrounds. Aerogels by themselves are hydrophilic, but chemical treatment can make them hydrophobic. If they absorb moisture they usually suffer a structural change, such as contraction, and deteriorate, but degradation can be prevented by making them hydrophobic. Aerogels with hydrophobic interiors are less susceptible to degradation than aerogels with only an outer hydrophobic layer, even if a crack penetrates the surface. Aerogels may have a thermal conductivity smaller than that of the gas they contain. This is caused by the Knudsen effect, a reduction of thermal conductivity in gases when the size of the cavity encompassing the gas becomes comparable to the mean free path. Effectively, the cavity restricts the movement of the gas particles, decreasing the thermal conductivity in addition to eliminating convection. For example, thermal conductivity of air is about 25 mW/m·K at STP and in a large container, but decreases to about 5 mW/m·K in a pore 30 nanometers in diameter. Aerogel structure results from a sol-gel polymerization, which is when monomers (simple molecules) react with other monomers to form a sol or a substance that consists of bonded, cross-linked macromolecules with deposits of liquid solution between them. When the material is critically heated the liquid is evaporated out and the bonded, cross-linked macromolecule frame is left behind. The result of the polymerization and critical heating is the creation of a material that has a porous strong structure classified as aerogel. Variations in synthesis can alter the surface area and pore size of the aerogel. The smaller the pore size the more susceptible the aerogel is to fracture. Aerogel contains particles that are 2–5 nm in diameter. After the process of creating aerogel, it will contain a large amount of hydroxyl groups on the surface. The hydroxyl groups can cause a strong reaction when the aerogel is placed in water, causing it to catastrophically dissolve in the water. One way to waterproof the hydrophilic aerogel is by soaking the aerogel with some chemical base that will replace the surface hydroxyl groups (–OH) with non-polar groups (–OR), a process which is most effective when R is an aliphatic group. There are several ways to determine the porosity of aerogel: the three main methods are gas adsorption, mercury porosimetry, and scattering method. In gas adsorption, nitrogen at its boiling point is adsorbed into the aerogel sample. The gas being adsorbed is dependent on the size of the pores within the sample and on the partial pressure of the gas relative to its saturation pressure. The volume of the gas adsorbed is measured by using the Brunauer, Emmit and Teller formula (BET), which gives the specific surface area of the sample. At high partial pressure in the adsorption/desorption the Kelvin equation gives the pore size distribution of the sample. In mercury porosimetry, the mercury is forced into the aerogel porous system to determine the pores' size, but this method is highly inefficient since the solid frame of aerogel will collapse from the high compressive force. The scattering method involves the angle-dependent deflection of radiation within the aerogel sample. The sample can be solid particles or pores. The radiation goes into the material and determines the fractal geometry of the aerogel pore network. The best radiation wavelengths to use are X-rays and neutrons. Aerogel is also an open porous network: the difference between an open porous network and a closed porous network is that in the open network, gases can enter and leave the substance without any limitation, while a closed porous network traps the gases within the material forcing them to stay within the pores. The high porosity and surface area of silica aerogels allow them to be used in a variety of environmental filtration applications. A 2.5 kg brick is supported by a piece of aerogel with a mass of 2 g.
Silica aerogel is the most common type of aerogel, and the most extensively studied and used. It is silica-based and can be derived from silica gel or by a modified Stober process. The lowest-density silica nanofoam weighs 1,000 g/m3, which is the evacuated version of the record-aerogel of 1,900 g/m3. The density of air is 1,200 g/m3 (at 20 °C and 1 atm). As of 2013[update], aerographene had a lower density at 160 g/m3, or 13% the density of air at room temperature. The silica solidifies into three-dimensional, intertwined clusters that make up only 3% of the volume. Conduction through the solid is therefore very low. The remaining 97% of the volume is composed of air in extremely small nanopores. The air has little room to move, inhibiting both convection and gas-phase conduction. Silica aerogels also have a high optical transmission of ~99% and a low refractive index of ~1.05. It has remarkable thermal insulative properties, having an extremely low thermal conductivity: from 0.03 W/(m·K) in atmospheric pressure down to 0.004 W/(m·K) in modest vacuum, which correspond to R-values of 14 to 105 (US customary) or 3.0 to 22.2 (metric) for 3.5 in (89 mm) thickness. For comparison, typical wall insulation is 13 (US customary) or 2.7 (metric) for the same thickness. Its melting point is 1,473 K (1,200 °C; 2,192 °F). Until 2011, silica aerogel held 15 entries in Guinness World Records for material properties, including best insulator and lowest-density solid, though it was ousted from the latter title by the even lighter materials aerographite in 2012 and then aerographene in 2013. Carbon aerogels are composed of particles with sizes in the nanometer range, covalently bonded together. They have very high porosity (over 50%, with pore diameter under 100 nm) and surface areas ranging between 400–1,000 m2/g. They are often manufactured as composite paper: non-woven paper made of carbon fibers, impregnated with resorcinol–formaldehyde aerogel, and pyrolyzed. Depending on the density, carbon aerogels may be electrically conductive, making composite aerogel paper useful for electrodes in capacitors or deionization electrodes. Due to their extremely high surface area, carbon aerogels are used to create supercapacitors, with values ranging up to thousands of farads based on a capacitance density of 104 F/g and 77 F/cm3. Carbon aerogels are also extremely "black" in the infrared spectrum, reflecting only 0.3% of radiation between 250 nm and 14.3 µm, making them efficient for solar energy collectors. The term "aerogel" to describe airy masses of carbon nanotubes produced through certain chemical vapor deposition techniques is incorrect. Such materials can be spun into fibers with strength greater than Kevlar, and unique electrical properties. These materials are not aerogels, however, since they do not have a monolithic internal structure and do not have the regular pore structure characteristic of aerogels. Metal oxide aerogels are used as catalysts in various chemical reactions/transformations or as precursors for other materials. Aerogels made with aluminium oxide are known as alumina aerogels. These aerogels are used as catalysts, especially when "doped" with a metal other than aluminium. Nickel–alumina aerogel is the most common combination. Alumina aerogels are also being considered by NASA for capturing hypervelocity particles; a formulation doped with gadolinium and terbium could fluoresce at the particle impact site, with the amount of fluorescence dependent on impact energy. One of the most notable differences between silica aerogels and metal oxide aerogel is that metal oxide aerogels are often variedly colored. Organic polymers can be used to create aerogels. SEAgel is made of agar. Cellulose from plants can be used to create a flexible aerogel. Chalcogel is an aerogel made of chalcogens (the column of elements on the periodic table beginning with oxygen) such as sulfur, selenium and other elements. Metals less expensive than platinum have been used in its creation. Aerogels made of cadmium selenide quantum dots in a porous 3-D network have been developed for use in the semiconductor industry. Aerogel performance may be augmented for a specific application by the addition of dopants, reinforcing structures and hybridizing compounds. Aspen Aerogels makes products such as Spaceloft which are composites of aerogel with some kind of fibrous batting. In 2004 about US$25 million of aerogel insulation product were sold, which had risen to about US$500 million by 2013. This represents the most substantial economic impact of these materials today. The potential to replace conventional insulation with aerogel solutions in the building and construction sector as well as in industrial insulation is quite significant. In granular form to add insulation to skylights. Georgia Institute of Technology's 2007 Solar Decathlon House project used an aerogel as an insulator in the semi-transparent roof. A chemical adsorber for cleaning up spills. A catalyst or a catalyst carrier. Silica aerogels can be used in imaging devices, optics, and light guides. A material for filtration due to its high surface area and porosity, to be used for the removal of heavy metals. Thickening agents in some paints and cosmetics. As components in energy absorbers. Laser targets for the United States National Ignition Facility. A material used in impedance matchers for transducers, speakers and range finders. Commercial manufacture of aerogel 'blankets' began around the year 2000, combining silica aerogel and fibrous reinforcement that turns the brittle aerogel into a durable, flexible material. The mechanical and thermal properties of the product may be varied based upon the choice of reinforcing fibers, the aerogel matrix and opacification additives included in the composite. NASA used an aerogel to trap space dust particles aboard the Stardust spacecraft. The particles vaporize on impact with solids and pass through gases, but can be trapped in aerogels. NASA also used aerogel for thermal insulation of the Mars Rover and space suits. The US Navy is evaluating aerogel undergarments as passive thermal protection for divers. In particle physics as radiators in Cherenkov effect detectors, such as the ACC system of the Belle detector, used in the Belle Experiment at KEKB. The suitability of aerogels is determined by their low index of refraction, filling the gap between gases and liquids, and their transparency and solid state, making them easier to use than cryogenic liquids or compressed gases. Their low mass is also advantageous for space missions. Resorcinol–formaldehyde aerogels (polymers chemically similar to phenol formaldehyde resins) are used as precursors for manufacture of carbon aerogels, or when an organic insulator with large surface is desired. They come as high-density material, with surface area about 600 m2/g. Metal–aerogel nanocomposites prepared by impregnating the hydrogel with solution containing ions of a transition metal and irradiating the result with gamma rays, precipitates nanoparticles of the metal. Such composites can be used as catalysts, sensors, electromagnetic shielding, and in waste disposal. A prospective use of platinum-on-carbon catalysts is in fuel cells. 2. The release rate of the drugs can be tailored by varying the properties of the aerogel. Carbon aerogels are used in the construction of small electrochemical double layer supercapacitors. Due to the high surface area of the aerogel, these capacitors can be 1/2000th to 1/5000th the size of similarly rated electrolytic capacitors. Aerogel supercapacitors can have a very low impedance compared to normal supercapacitors and can absorb or produce very high peak currents. At present, such capacitors are polarity-sensitive and need to be wired in series to achieve a working voltage of greater than about 2.75 V.
Dunlop Sport uses aerogel in some of its racquets for tennis, squash and badminton. In water purification, chalcogels have shown promise in absorbing the heavy metal pollutants mercury, lead, and cadmium from water. Aerogel can introduce disorder into superfluid helium-3. In aircraft de-icing, a new proposal uses a carbon nanotube aerogel. A thin filament is spun on a winder to create a 10 micron-thick film, equivalent to an A4 sheet of paper. The amount of material needed to cover the wings of a jumbo jet weighs 80 grams (2.8 oz). Aerogel heaters could be left on continuously at low power, to prevent ice from forming. Thermal insulation transmission tunnel of the Chevrolet Corvette (C7). CamelBak uses aerogel as insulation in a thermal sport bottle. 45 North uses aerogel as palm insulation in its Sturmfist 5 cycling gloves. PrimaLoft uses aerogel for performance wear insulation. Silica aerogels are typically synthesized by using a sol-gel process. The first step is the creation of a colloidal suspension of solid particles known as a "sol". The precursors are a liquid alcohol such as ethanol which is mixed with a silicon alkoxide, such as tetramethoxysilane (TMOS), tetraethoxysilane (TEOS), and polyethoxydisiloxane (PEDS) (earlier work used sodium silicates). The solution of silica is mixed with a catalyst and allowed to gel during a hydrolysis reaction which forms particles of silicon dioxide. The oxide suspension begins to undergo condensation reactions which result in the creation of metal oxide bridges (either M–O–M, "oxo" bridges or M–OH–M, "ol" bridges) linking the dispersed colloidal particles. These reactions generally have moderately slow reaction rates, and as a result either acidic or basic catalysts are used to improve the processing speed. Basic catalysts tend to produce more transparent aerogels and minimize the shrinkage during the drying process and also strengthen it to prevent pore collapse during drying. Finally, during the drying process of the aerogel, the liquid surrounding the silica network is carefully removed and replaced with air, while keeping the aerogel intact. Gels where the liquid is allowed to evaporate at a natural rate are known as xerogels. As the liquid evaporates, forces caused by surface tensions of the liquid-solid interfaces are enough to destroy the fragile gel network. As a result, xerogels cannot achieve the high porosities and instead peak at lower porosities and exhibit large amounts of shrinkage after drying. In 1931, to develop the first aerogels, Kistler used a process known as supercritical drying which avoids a direct phase change. By increasing the temperature and pressure he forced the liquid into a supercritical fluid state where by dropping the pressure he could instantly gasify and remove the liquid inside the aerogel, avoiding damage to the delicate three-dimensional network. While this can be done with ethanol, the high temperatures and pressures lead to dangerous processing conditions. A safer, lower temperature and pressure method involves a solvent exchange. This is typically done by exchanging the initial aqueous pore liquid for a CO2-miscible liquid such as ethanol or acetone, then onto liquid carbon dioxide and then bringing the carbon dioxide above its critical point. A variant on this process involves the direct injection of supercritical carbon dioxide into the pressure vessel containing the aerogel. The end result of either process exchanges the initial liquid from the gel with carbon dioxide, without allowing the gel structure to collapse or lose volume. Resorcinol–formaldehyde aerogel (RF aerogel) is made in a way similar to production of silica aerogel. A carbon aerogel can then be made from this resorcinol–formaldehyde aerogel by pyrolysis in an inert gas atmosphere, leaving a matrix of carbon. It is commercially available as solid shapes, powders, or composite paper. Additives have been successful in enhancing certain properties of the aerogel for the use of specific applications. Aerogel composites have been made using a variety of continuous and discontinuous reinforcements. The high aspect ratio of fibers such as fiberglass have been used to reinforce aerogel composites with significantly improved mechanical properties. Silica-based aerogels are not known to be carcinogenic or toxic. However, they are a mechanical irritant to the eyes, skin, respiratory tract, and digestive system. Small silica particles can potentially cause silicosis when inhaled. They can also induce dryness of the skin, eyes, and mucous membranes. Therefore, it is recommended that protective gear including respiratory protection, gloves and eye goggles be worn whenever handling or processing bare aerogels. ^ R. G. Jones; J. Kahovec; R. Stepto; E. S. Wilks; M. Hess; T. Kitayama; W. V. Metanomski (2008). IUPAC. Compendium of Polymer Terminology and Nomenclature, IUPAC Recommendations 2008 (the "Purple Book") (PDF). RSC Publishing, Cambridge, UK. ^ A. D. McNaught; A. Wilkinson. (1997). IUPAC. Compendium of Chemical Terminology, 2nd ed. (the "Gold Book") (XML on-line corrected version ed.). Oxford: Blackwell Scientific Publications. doi:10.1351/goldbook. ISBN 978-0-9678550-9-7. ^ Definitions of terms relating to the structure and processing of sols, gels, networks, and inorganic-organic hybrid materials (IUPAC Recommendations 2007). Pure and Applied Chemistry. 79. 2007. pp. 1801–1829. doi:10.1351/goldbook.A00173. ISBN 978-0-9678550-9-7. Archived from the original on 30 November 2012. ^ "Guinness Records Names JPL's Aerogel World's Lightest Solid". NASA. Jet Propulsion Laboratory. 7 May 2002. Archived from the original on 25 May 2009. Retrieved 25 May 2009. ^ Taher, Abul (19 August 2007). "Scientists hail 'frozen smoke' as material that will change world". News Article. London: Times Online. Archived from the original on 12 September 2007. Retrieved 22 August 2007. ^ Barron, Randall F.; Nellis, Gregory F. (2016). Cryogenic Heat Transfer (2nd ed.). CRC Press. p. 41. ISBN 9781482227451. Archived from the original on 22 November 2017. ^ Kistler, S. S. (1931). "Coherent expanded aerogels and jellies". Nature. 127 (3211): 741. Bibcode:1931Natur.127..741K. doi:10.1038/127741a0. ^ Kistler, S. S. (1932). "Coherent Expanded-Aerogels". Journal of Physical Chemistry. 36 (1): 52–64. doi:10.1021/j150331a003. ^ Pekala, R. W. (1989). "Organic aerogels from the polycondensation of resorcinol with formaldehyde". Journal of Materials Science. 24 (9): 3221–3227. Bibcode:1989JMatS..24.3221P. doi:10.1007/BF01139044. ISSN 0022-2461. ^ Pekala R. W. (1989). "Organic aerogels from the polycondensation of resorcinol with formaldehyde". Journal of Materials Science. 24 (9): 3221–3227. Bibcode:1989JMatS..24.3221P. doi:10.1007/BF01139044. ^ "What is Aerogel? Theory, Properties and Applications". azom.com. 12 December 2013. Archived from the original on 9 December 2014. Retrieved 5 December 2014. ^ Aerogel Structure Archived 25 December 2014 at the Wayback Machine. Str.llnl.gov. Retrieved on 31 July 2016. ^ "Silica Aerogel". Aerogel.org. Archived from the original on 4 April 2016. ^ Surface Chemistry : Silica Aerogels Archived 1 December 2014 at the Wayback Machine. Energy.lbl.gov. Retrieved on 31 July 2016. ^ Pore Structure : Silica Aerogels Archived 1 December 2014 at the Wayback Machine. Energy.lbl.gov. Retrieved on 31 July 2016. ^ "Lab's aerogel sets world record". LLNL Science & Technology Review. October 2003. Archived from the original on 9 October 2006. ^ Groom, D.E. Abridged from Atomic Nuclear Properties Archived 27 February 2008 at the Wayback Machine. Particle Data Group: 2007. ^ "Ultra-light Aerogel Produced at a Zhejiang University Lab-Press Releases-Zhejiang University". Zju.edu.cn. 19 March 2013. Archived from the original on 23 May 2013. Retrieved 12 June 2013. ^ "About Aerogel". ASPEN AEROGELS, INC. Archived from the original on 26 May 2014. Retrieved 12 March 2014. ^ Gurav, Jyoti L.; Jung, In-Keun; Park, Hyung-Ho; Kang, Eul Son; Nadargi, Digambar Y. (11 August 2010). "Silica Aerogel: Synthesis and Applications". Journal of Nanomaterials. 2010: 1–11. doi:10.1155/2010/409310. ISSN 1687-4110. Archived from the original on 3 May 2016. ^ Mecklenburg, Matthias (July 2012). "Aerographite: Ultra Lightweight, Flexible Nanowall, Carbon Microtube Material with Outstanding Mechanical Performance". Advanced Materials. 24 (26): 3486–90. doi:10.1002/adma.201200491. PMID 22688858. ^ "Metal Oxide Aerogels". Aerogel.org. Archived from the original on 12 August 2013. Retrieved 12 June 2013. ^ Kobayashi, Yuri; Saito, Tsuguyuki; Isogai, Akira (2014). "Aerogels with 3D Ordered Nanofiber Skeletons of Liquid-Crystalline Nanocellulose Derivatives as Tough and Transparent Insulators". Angewandte Chemie International Edition. 53 (39): 10394–7. doi:10.1002/anie.201405123. PMID 24985785. Lay summary – Royal Society of Chemistry (11 July 2014). ^ Biello, David Heavy Metal Filter Made Largely from Air. Archived 26 February 2015 at the Wayback Machine Scientific American, 26 July 2007. Retrieved on 2007-08-05. ^ Yu, H; Bellair, R; Kannan, R. M.; Brock, S. L. (2008). "Engineering Strength, Porosity, and Emission Intensity of Nanostructured CdSe Networks By Altering The Building Block Shape". Journal of the American Chemical Society. 130 (15): 5054–5055. doi:10.1021/ja801212e. PMID 18335987. ^ "Spaceloft 6250" (PDF). Aspen Aerogels. Archived from the original (PDF) on 27 April 2014. Retrieved 25 April 2014. ^ "Strong and Flexible Aerogels". Aerogel.org. Archived from the original on 11 October 2014. Retrieved 17 July 2014. ^ Koebel, Matthias; Rigacci, Arnaud; Achard, Patrick (2012). "Aerogel-based thermal superinsulation: an overview" (PDF). Journal of Sol-Gel Science and Technology. 63 (3): 315–339. doi:10.1007/s10971-012-2792-9. ^ Spoon, Marianne English (25 February 2014). "'Greener' aerogel technology holds potential for oil and chemical clean-up". University of Wisconsin Madison News. Archived from the original on 28 April 2015. Retrieved 29 April 2015. ^ Gurav, Jyoti; Jung, In-Keun (30 June 2010). "Silica Aerogel: Synthesis and Applications". Journal of Nanomaterials. ^ Hrubesh, Lawrence W. (1 April 1998). "Aerogel applications". Journal of Non-Crystalline Solids. 225 (1): 335–342. Bibcode:1998JNCS..225..335H. doi:10.1016/S0022-3093(98)00135-5. ^ Nuckols, M. L.; Chao J. C.; Swiergosz M. J. (2005). "Manned Evaluation of a Prototype Composite Cold Water Diving Garment Using Liquids and Superinsulation Aerogel Materials". United States Navy Experimental Diving Unit Technical Report. NEDU-05-02. Archived from the original on 20 August 2008. Retrieved 21 April 2008. ^ Smirnova I.; Suttiruengwong S.; Arlt W. (2004). "Feasibility study of hydrophilic and hydrophobic silica aerogels as drug delivery systems". Journal of Non-Crystalline Solids. 350: 54–60. Bibcode:2004JNCS..350...54S. doi:10.1016/j.jnoncrysol.2004.06.031. ^ Juzkow, Marc (1 February 2002). "Aerogel Capacitors Support Pulse, Hold-Up, and Main Power Applications". Power Electronic Technology. Archived from the original on 15 May 2007. ^ Carmichael, Mary. First Prize for Weird: A bizarre substance, like 'frozen smoke,' may clean up rivers, run cell phones and power spaceships. Archived 17 August 2007 at the Wayback Machine Newsweek International, 13 August 2007. Retrieved on 2007-08-05. ^ Halperin, W. P. and Sauls, J. A. Helium-Three in Aerogel. Arxiv.org (26 August 2004). Retrieved on 7 November 2011. ^ "De-icing aeroplanes: Sooty skies". The Economist. 26 July 2013. Archived from the original on 30 December 2013. Retrieved 11 December 2013. ^ Katakis, Manoli. (11 July 2013) NASA Aerogel Material Present In 2014 Corvette Stingray Archived 22 February 2014 at the Wayback Machine. GM Authority. Retrieved on 2016-07-31. ^ Camelbak Podium Ice Insulated Bottle – Review Archived 3 October 2014 at the Wayback Machine. Pinkbike. Retrieved on 31 July 2016. ^ Unparalleled Cold Weather Performance Archived 10 January 2016 at the Wayback Machine. 45NRTH. Retrieved on 31 July 2016. ^ Dorcheh, Soleimani; Abbasi, M. (2008). "Silica Aerogel; Synthesis, Properties, and Characterization". Journal of Materials Processing Technology. 199 (1–3): 10–26. doi:10.1016/j.jmatprotec.2007.10.060. ^ a b c "Making silica aerogels". Lawrence Berkeley National Laboratory. Archived from the original on 14 May 2009. Retrieved 28 May 2009. ^ Pierre, A. C.; Pajonk, G. M. (2002). "Chemistry of Aerogels and their Applications". Chemical Reviews. 102 (11): 4243–4265. doi:10.1021/cr0101306. PMID 12428989. ^ Fricke, Jochen; Emmerling, Andreas (1992). "Aerogels". Journal of the American Ceramic Society. 75 (8): 2027–2036. doi:10.1111/j.1151-2916.1992.tb04461.x. NASA's Stardust comet return mission on AEROGEL. N. Hüsing; U. Schubert (1998). "Aerogels – Airy Materials: Chemistry, Structure, and Properties". Angewandte Chemie International Edition. 37 (1/2): 22–45. doi:10.1002/(SICI)1521-3773(19980202)37:1/2<22::AID-ANIE22>3.0.CO;2-I. Pierre A. C.; Pajonk G. M. (2002). "Chemistry of aerogels and their applications". Chemical Reviews. 102 (11): 4243–4266. doi:10.1021/cr0101306. PMID 12428989. 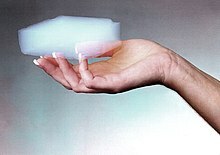 Wikimedia Commons has media related to Aerogel.